This Italian Style Stir Fry comes together so quick and easy – it’s perfect for weeknight’s when you are trying to eat healthy and get dinner on the table! If you didn’t already notice, some of my blogging buddies are having babies. Quite a few actually. It’s awesome and I absolutely love when I hear of another preggo joining the bunch, especially the first time moms! Since becoming a new mom can sometimes mean a little less time and less energy to get dinner on the table every night, I am sharing an easy dinner recipe for Italian Style Stir Fry that I find myself throwing together for my family quite often. It’s one that everyone in the family enjoys so of course that’s a winner in my book. I always keep precooked chicken sausages for quick throw together recipes just like this one. I picked these up – along with a couple other varieties – at Costco and I can’t tell you how often they have saved the day at dinnertime. Serve this Italian inspired “stir fry” over brown rice or orzo for a healthy easy weeknight meal. 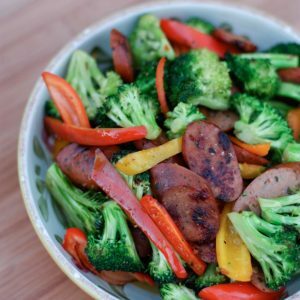 This Italian Style Stir Fry recipe was featured in Healthy Dinner Recipes for Beginners on Greatist! Best wishes to Katie and her husband on their upcoming bundle! Heat 1 tablespoon olive oil in a large non stick skillet over medium heat. Add chicken sausage pieces and brown on both sides for about 5-6 minutes. Take chicken sausage out of pan and set aside on a plate. Heat 1 tablespoon olive oil in same skillet. Raise heat to medium high. Add minced garlic, broccoli and peppers to pan and saute for 3-4 minutes. Season with oregano, salt and pepper. Add chicken sausage back in pan and gently toss, cooking together for another few minutes until vegetables are bright and slightly crisp. Serve over brown rice or whole wheat orzo drizzled in olive oil, salt, pepper and parmesan cheese. Check out the blogs below for more easy recipes and crafts in honor of Katie and her growing family! I LOVE to do stir fry for quick weeknight meals (thanks to you getting me hooked)! And how funny that I just made a Costco list…. will make sure to get the Italian Chicken Sausages this time for this recipe. Easy and loaded with veggies! I love that you used chicken sausage! Yes please!!! This is my type of protein + veggie packed meal!! I always have pre-cooked sausage on hand too. But I’ve never thought to put it in a stir-fry! Reminds me of when I saw Katie using them in kebobs. You ladies are so so smart. And yes, talented too! Thanks for joining in to celebrate Katie and her baby bump today! This sounds fabulous. I’m a huge fan of chicken sausage! Im always looking for these quick throw together dishes for our busy nights – this sounds great! Boy. I could likely eat an entire batch of this by myself! 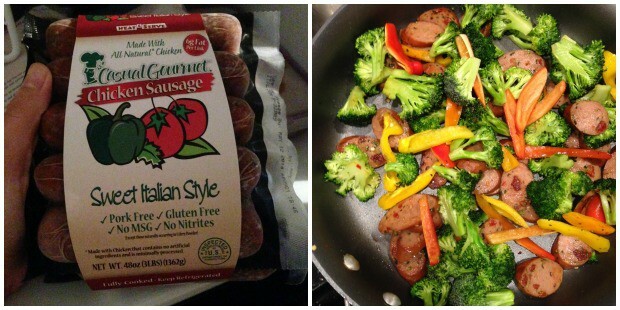 What a fantastic meal with the sausage, peppers, and broccoli! Oh Aggie, I’m so glad we’ve become friends in real life. I can’t wait for our boys to meet and eventually play together! What an awesome idea for dinner. Love the idea of Italian Stir Fry! Next time I go to Costco I’ll definitely stock up on some chicken sausage so I can make this once our little guy is here. So bright and delicious! An Italian stir fry is genius! This stir fry is amazing! So vibrant with colors and flavors! 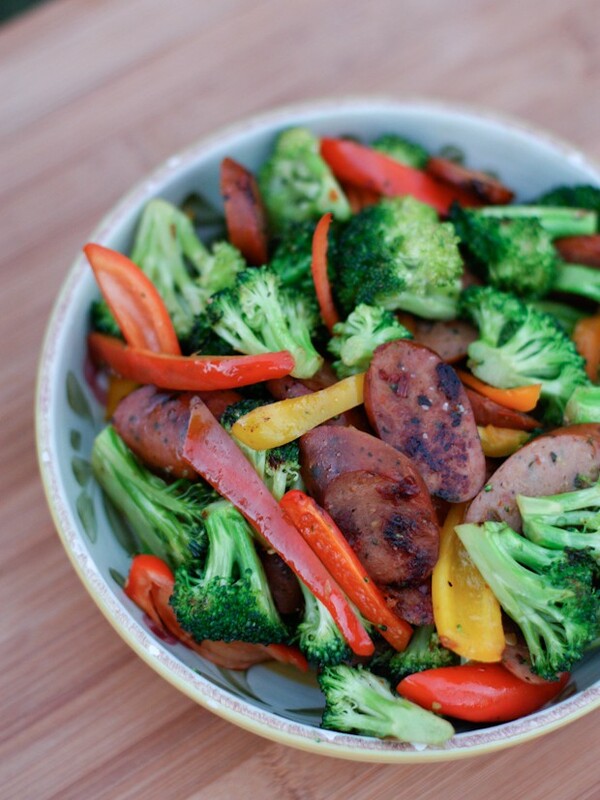 What a scrumptious, colorful and healthy stir fry! This looks right up my alley! 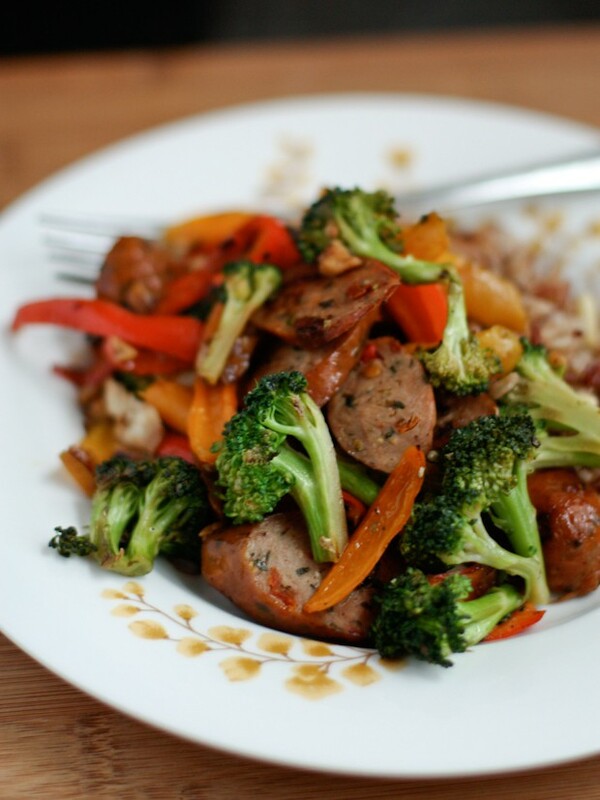 an italian stir fry – what a fun idea, love it! What a great idea – we have a local brand of chicken sausage that I always try to keep in stock here at home. It would be perfect in this -thanks! Another awesome simple recipe, Aggie. I must try this!! This dish is right up my alley! What a great colorful dish! What an absolutely gorgeous dish! I am going to look for those pre cooked chicken sausages to keep on hand for meals. Thanks for the awesome tip and delicious dinner! ohhhh, I love the sweet Italian chicken sausage that you used in this! My husband is such a fan of stir fry, he would simply adore this dish!